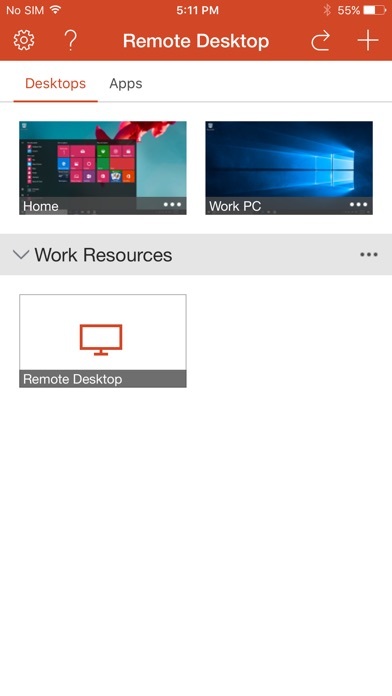 Overview With the Microsoft Remote Desktop app, you can connect to a remote PC and your work resources from almost anywhere. Experience a rich Windows experience with RemoteFX in a Remote Desktop client designed to help you get your work done wherever you are. Getting Started Windows Professional and Windows Server editions are supported. 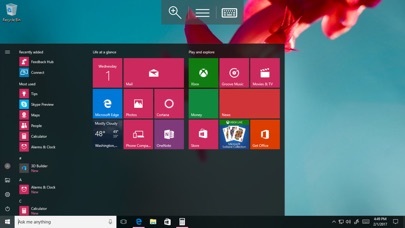 To view the full list of supported Windows versions and successfully connect to a Windows PC, read the FAQ at https://technet.microsoft.com/en-us/library/dn473015.aspx Don't know how to configure your PC to access it remotely? 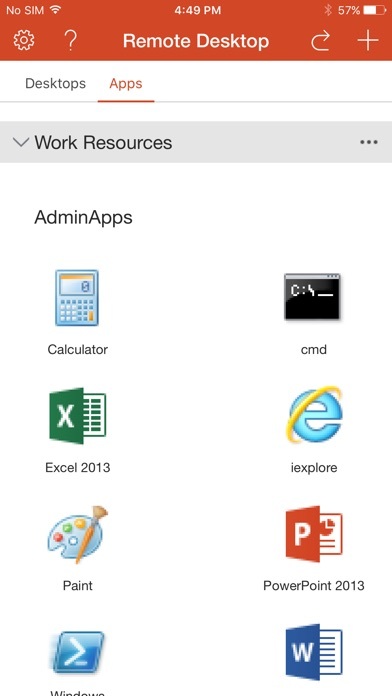 Download the RDP assistant on your Windows PC and let it do the work for you: https://aka.ms/rdassistant Features * Access to remote resources through your Remote Desktop Gateway * Rich multi-touch experience that supports Windows gestures and RemoteFX * Secure connection to your data and applications * Simple management of all remote connections from the connection center * Seamless audio and video streaming * Easy connection to external monitors or projectors for presentations Have a question? Post it at http://aka.ms/rd-clients-forum Have an idea? Add to our feature suggestion box in the app (Settings -> Recommend New Features)"
Does not compatible with iPhone X screen, but all is running fine. I like this app, but the one thing that drives me crazy is the keyboard. If you use a bluetooth keyboard, you must pop up the on screen keyboard to use it. You would think that if you have an external keyboard it would just work. I wouldn’t normally have complained about this since this seems to be the nature of other iPad apps (like the store app where I’m trying this). 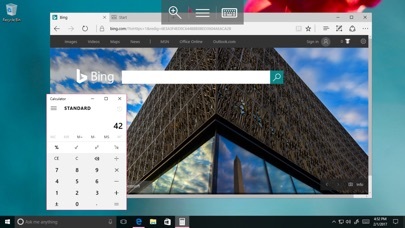 However, Splash Desktop does let you use an external keyboard without the popup keyboard blocking half of your Remote Desktop screen. Otherwise, its OK.
Not sized for XS Max?? This still isn’t sized properly for the XS Max screen. Last update was 9 months ago. Really Microsoft?? Really easy to use and responsive. I really like how it basically turns your screen into a track pad for mouse movement. One thing that annoys the heck out of me is it doesn’t actually use the full screen on the iPad Pro 11. So much wasted space. Hello, there seems to be an issue when being connected to a VPN and trying to connect to a server by supplying the host name instead of the IP address. Supplying the host name works fine at our company’s location, but it appears over VPN it doesn’t resolve the host name. I’m pretty certain this is an issue with iOS 12, as I could replicate it in mobile Safari and it works fine on all other platforms with your client, so I just wanted to bring it to your attention which is why I still gave 5 stars. The iPhone X has been out for a year and a half but microsoft hasn’t updated it for the new stretched 19.5:9 aspect ratio, I’ve used this app a lot in the past to access my desktop from work and home when I am on trips for personal or business. I enjoy it but I really wish that the app got updated, I still use it but the support is bad if such a big company hasn’t updated in 9 months and hasn’t updated for apple’s newest phones for a year and a half. Please fix your app microsoft so I can fix my review on this otherwise great app. Usable, with some plenty of quirks. No iPhone X screen support. I saw confusion on how this works on other reviews so to clearify, to access this outside the same local network, you have to portforward the ip of your pc. So setup a server. If you don't know how to do this I would suggest a different solution such as chrome remote desktop, which is especially nice if you already use chrome on your desktop. I started using this because it was built in windows, and it performs extremely well and smooth. 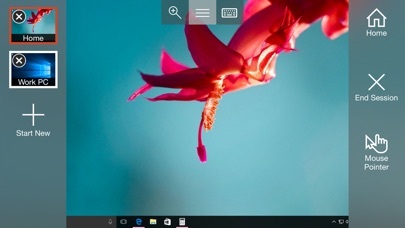 When remote desktopping from a different windows computer it is the closest you can get to seamless remote desktop. Biggest problem with this specific app is the lack of support for newer devices such as the iPhone X, XS, and their respective variations. Still no support for iPad Pro 11. Please update the app to support the 11 inch ipad pro screen size. There is also some weirdness when switching back and forth between apps with the ipad pro keyboard.